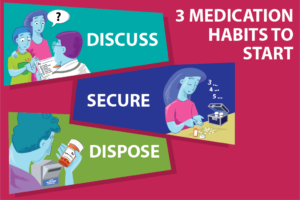 The Kenosha County Substance Abuse Coalition (KCSAC) invites you to start three medication habits: DISCUSS, SECURE, DISPOSE. Of course, if you’re already doing these, please do continue! DISCUSS why your doctor feels the recommendation is best for you. DISCUSS why you think it may not be. DISCUSS the benefits, side effects, and risk factors of a medication before deciding to take it. DISCUSS other options available to you, including those that are non-medical. SECURE means using a lockbox rather than a medicine cabinet for your medications. SECURE means keeping that lockbox in a safe place, such as a locked closet, inaccessible to those who may abuse the medications. SECURE means knowing exactly how many medications are being dispensed and how many are left. SECURE also means securing the medications only for use by the person they were prescribed to. Sharing medications is illegal and unsafe. DISPOSE of your medications at one of the many medication drop box locations that you can find here. Research indicates that Lake Michigan is being contaminated by improperly disposed pharmaceuticals; don’t be a person making that contamination worse by flushing your pharma! DISPOSE of unused medications using DisposeRx, a simple home waste disposal solution that uses non-toxic polymers to permanently sequester prescription drugs. DisposeRx works for powders, pills, tablets, capsules, liquids, and patches, making them inert and unavailable for illicit use or contamination. Contact us for more information or a DisposeRx packet.